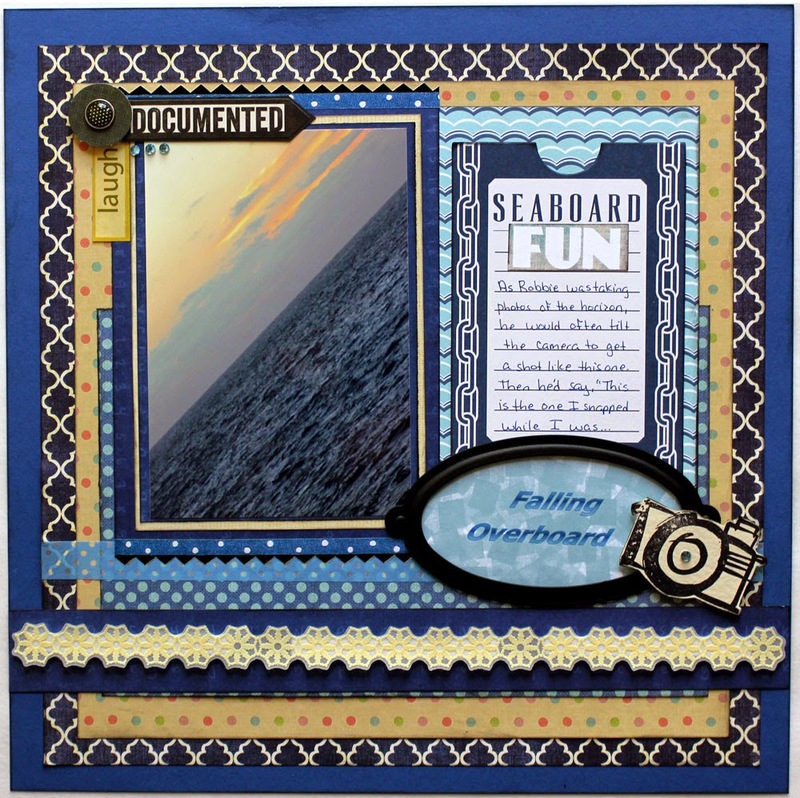 Today I have several layouts to share - all of these were created for our 10th Anniversary Cruise Albums and were inspired by challenges in the Stashbusters Anonymous workshop. This first one uses scraps of paper to create a chevron pattern as part of the background of the layout. I also added some scattered sequins on this layout, then put a drop of glitter glue on top of each. 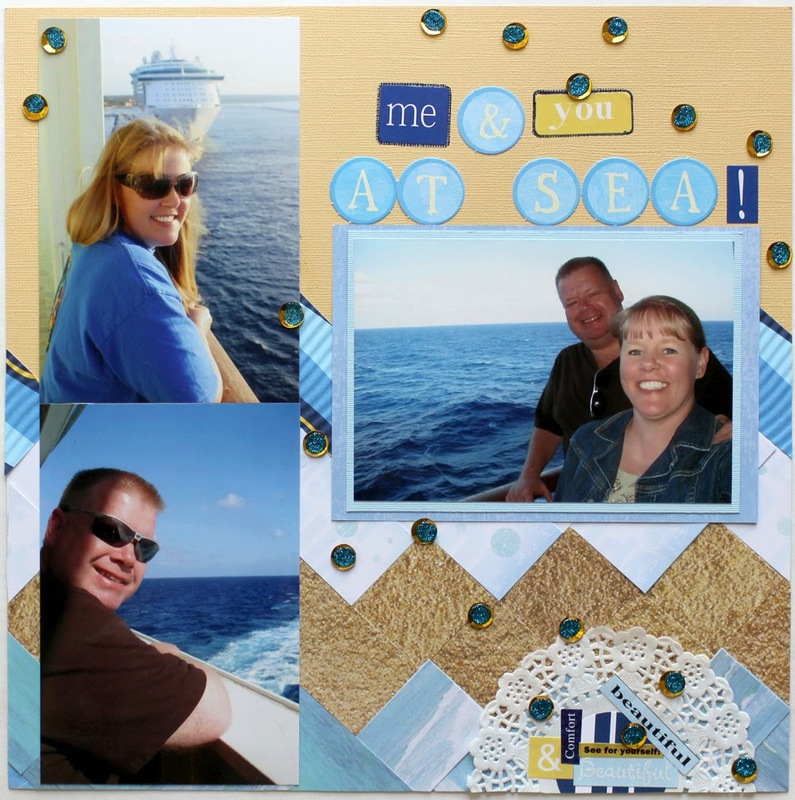 One of the elements that I'm continuing to add to the pages for our cruise albums is a small cluster of words. This is the one design element that I've used throughout these albums - a little something to tie all the miscellaneous layouts together. Another challenge in the Stashbusters workshop encouraged us to use some of our metal embellishments. I used a large black metal frame around my title on this next layout. I also added a metal brad in the word embellishment cluster. Journaling reads: As Robbie was taking photos of the horizon, he would often tilt the camera to get a shot like this one. Then he'd say, "This is the one I snapped while I was falling overboard." 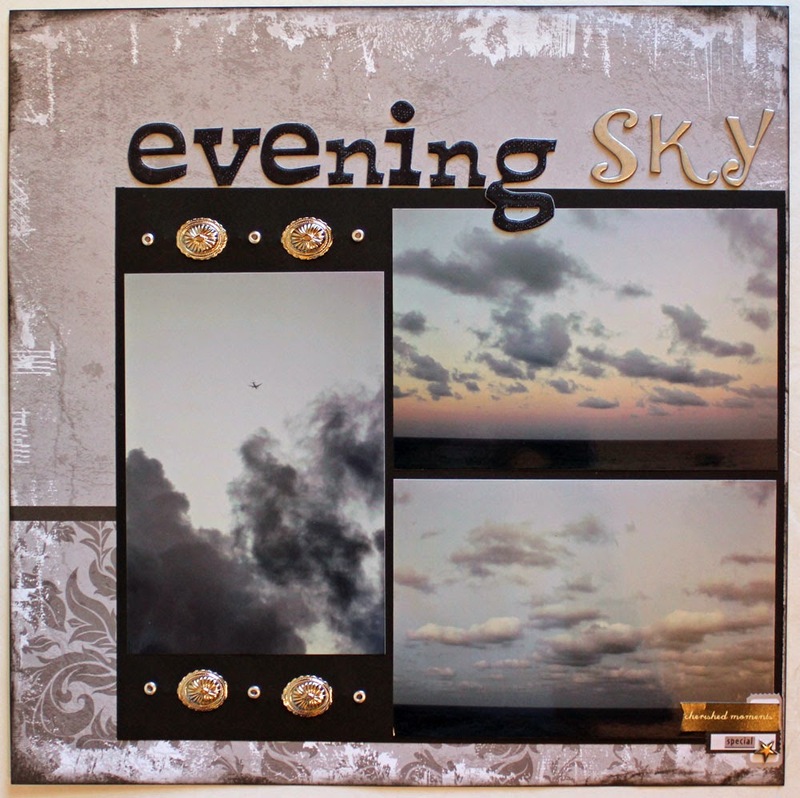 Here's another layout using metal brads and eyelets as a border above and below one of the photos. This last layout today is one of my very favorites. I decided to try the sunburst challenge again, this time using washi tape! I also used some small metal embellishments near the title and journaling blocks. I'm putting our cruise albums together with the layouts sorted by theme or category. 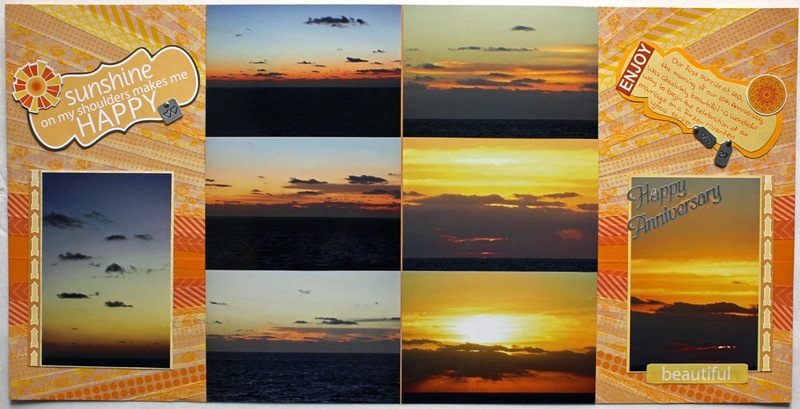 These layouts will all go in the section I've titled "At Sea" and (as you can see) showcase photos taken of the water and sky and horizon while we were at sea. How do you organize the layouts in your vacation theme albums? 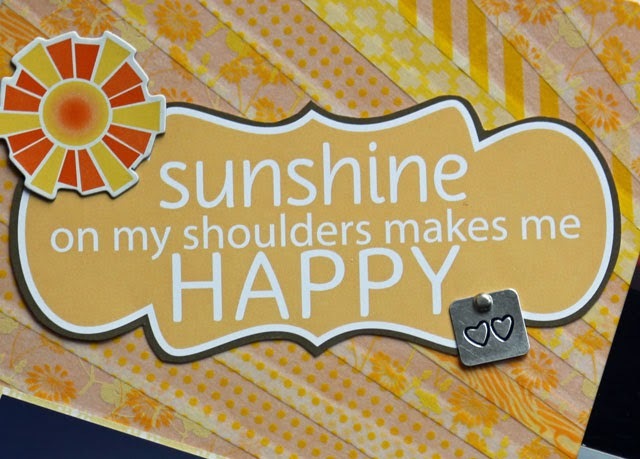 Love that washi tape sunburst. I wouldn't have enough of one color to pull that off, though I could probably do a decent rainbow effect. When I create vacation albums they are generally chronological as opposed to thematic. Although I do have some themes going in Disney albums (like "meeting characters") where pictures from different days are pulled together. More stashbusting - more terrific pages - you are a wonder! Fabulous job! Way to keep busting through your stash! They all look great! Wow! You've accomplished quite a lot. Keep it up! Well done on getting so many pages and stories done. 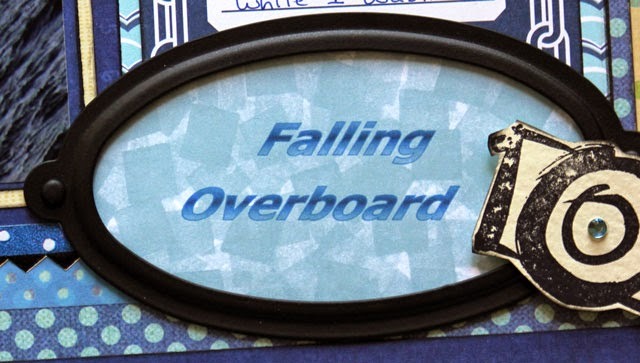 Robbie's comment about falling overboard made me laugh - tis the sort of thing Wookie would do. I've just used some of my metal frames, fun to pull those out. You've made a lot of progress here! Love the washi tape sunburst. I always organize our travel albums chronologically. That's a neat way to create a chevron :). All your pages are full of interest - how do you manage to make so many so nicely? Takes me ages to create one :(.